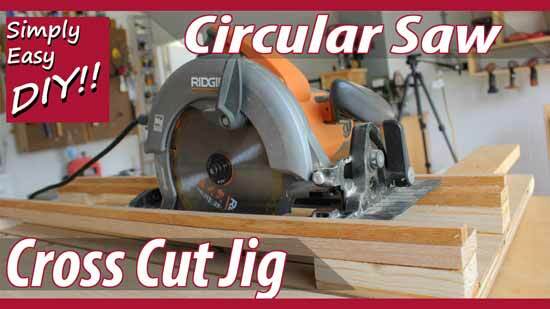 A DIY circular saw crosscut jig that is simple and easy to make. I hear it all the time. People tell me how they struggle to make straight cuts with a circular saw. If you have years of experience with them it is easy to lose sight of the struggles of those with less experience. I think one of the problems people have with circular saws (among many) is that you have to do two things at once. Keep the saw against your fence or straight edge you are using and push through the cut. I think sometimes it is easy to get focused on one thing and lose sight of the second. Before you know it, your cut is off. Leaving someone to wonder what went wrong. Well this circular saw crosscut jig eliminates the need to try and keep the saw against a guide of some sort and allows the user to just push through the cut. It expands on the cut width available by many of the cheaper miter saws. with the measurements provided here has the capacity to cross cut up to 22 inches. A few simple modifications and one can make angled cuts just as easily. 1 Plywood Base Piece @ 16" x 38"
1 Plywood Outfeed Base Piece @ 16" x 34"
4 Spacer Blocks @ 7/8" x 1.5" x 4"
1 Bottom Rail @ .5" x 1.5" x 38"
1 Bottom Rail @ .5" x 1.75" x 38"
2 Top Guide Rails @ .25" x .5" x 38"
All my materials came from scrape lumber out of my bin. I use oak for the top two rail pieces. Pine for the spacers and plywood for the base and out feed base pieces. Whatever you happen to have will probably work with one slight exception. 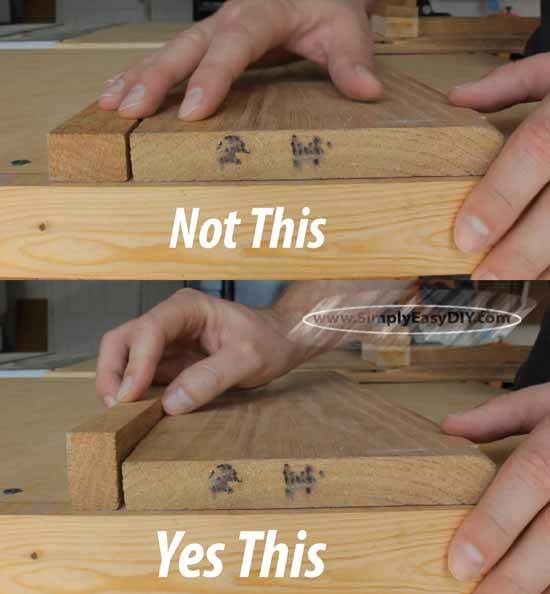 If you are using actual lumber, such as oak, like I did for the top guide pieces then you are going to want to turn that piece 90 degrees so that the wood grain will expand up and down instead of side to side in the project. It's the same reason I didn't just route a rabbet in a 3/4" piece of oak and then attach that to the spacers. When the lumber expands it could expand to a point where it hinders you from sliding your circular saw through the guide rails. Most of woods movement is tangent to the ring direction. Also, the amount of movement is proportional to its size. In simple speak, keep the pieces small and flip the grain direction so that its main movement will be up and down not side to side. Also the amount of moisture that the wood is able to absorb will affect its movement. Hardwoods such as Oak has a tighter grain structure than soft species like pine making it more stable. Sealing the wood will help keep its expansion and contraction to a minimum as well. A coat of wax seals the grain allowing less moisture to be absorbed in the summer and lost in the winter. All these things together limits potential problems with movement of the wood just like you would take into account with any project. Does it eliminate it completely? No, but it limits it and keeps the margin of error within reason. Many projects fail prematurely because they treat wood as if it's a static component when it's not. Learn woods tendencies, don't fear them. It will only make you and your projects better. Ultimately the materials you use are up to you. It's just good to be aware of the specific properties of the materials you are incorporating into your project. There are materials that would eliminate expansion and contraction all together. Hardboard for one. Obviously not for the bottom rails as it doesn't have the required rigidity for the weight of even the lightest saws. However, it would make a nice material for the top guide rails as it does not expand and contract. Laminated particle board that is otherwise known as melamine for another. This would make a nice smooth surface in which to slide the saw. However, you would have to watch the span limitations. Acrylic sheeting has nice rigidity to a limited span and weight. I could not vouch for the span you could have before it started to bow under the weight of a circular saw. It would provide a smooth gliding surface too. Angle irons if you have the ability to drill through steel. This is probably the material I'll hear a lot about in the comments section on YouTube. If you were using screws to attach it to the spacers, you would need to countersink them so the heads of the screws sit flush with the top of the iron. Why did I not use angle irons? As anyone who has been around my website or YouTube Channel a while will tell you, I'm cheap. I use materials that I already have in my shop first and foremost to keep costs down. That is why I used the materials I used in the manner in which I used them. This does not preclude using other materials in place of anything I used to get the same result. "Use whats you got. ", I says. What I used is what I had. I will always recommend you do the same. Nice information with Video. I have a MAKITA CIRCULAR SAW but i want to need another CIRCULAR saw Scroll Saw. Would kindly suggest which are the Best Scroll Saw on the market? Very nice tutorial and I think you chose the best circular saw for the job, too!